WELDON, N.C. – Halifax Community College (HCC) was proud to host Congressman G.K. Butterfield on April 12 at The Center @ HCC. Congressman Butterfield joined more than 240 students, faculty, and staff to discuss policies and practices the work of Congress. He went on to discuss his constituencies and how the policies of Congress will impact the Roanoke Valley. Further, he addressed specific questions from HCC students about the future of financial aid, and the TRIO program. Congressman Butterfield went on to address the budgetary concerns that impact students’ abilities to fund their education, most notably the Pell grant initiatives. However, Butterfield made it clear that, if they have the means students should do what it takes to take the classes, finish the degree, and move ahead with their journeys. In addition to financial discussions, Butterfield also shared positive, and reassuring, information about the future job market. When discussing the industries who are projected to see growth, he shared the careers in the STEM fields – Science, Technology, Engineering, and Mathematics – are expected to see an increase of 1.5 million jobs in coming years. For the HCC students in attendance, it was encouraging note about job prospects. President Michael Elam was excited to host Butterfield and provide the opportunity for students to interact. 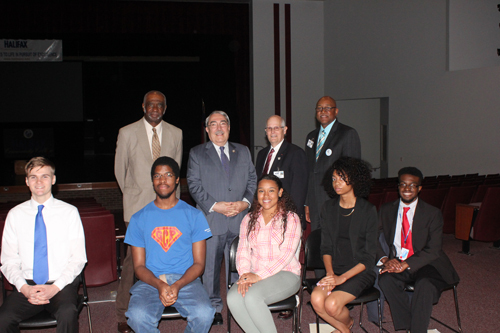 "It was an honor to host Congressman G.K. Butterfield on our campus," he said. "We are delighted that he chose to come to HCC and share with us the major issues facing higher education now in Congress. Our students will remember their interaction with him for years to come." Several members of the HCC Board of Trustees were in attendance for the event. Board chairperson, Michael Felt, spoke to those gathered and expressed his appreciation for Butterfield’s continuous support of HCC and the educational mission of the community college. As Butterfield was ending his remarks, he challenged all HCC students to do two things: vote in every election, and talk about the issues with their peers. "Stay engaged in the process, and it will change the future," he said. Kennametal executives and HCC leadership tour the Industrial Systems lab.